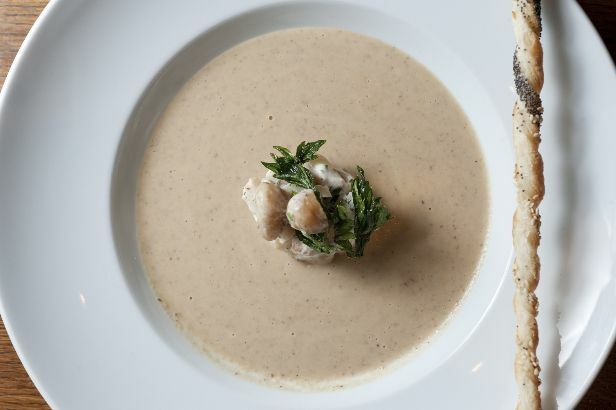 A recipe for Chestnut, Celery Root and Apple Soup from Daniel Boulud. A lovely addition to a fancy fall dinner party. Heat the oil in a stockpot or large casserole over medium heat. Add the onion, leek, apples, celery root, bay leaf, thyme, nutmeg and salt and pepper to taste and cook, stirring occasionally, for about 10 minutes, or until the onions and leeks are soft but not colored. Add the chestnuts and chicken stock and bring to a boil. Lower the heat to a simmer and cook, skimming the surface regularly, for 35 to 40 minutes, or until the chestnuts can be mashed easily with a fork. Add the heavy cream and simmer for 5 to 10 minutes more, then remove from heat and discard the bay leaf and thyme. Puree the soup until smooth, using a blender, hand-held immersion blender or a food processor, and working in batches if necessary, then pass it through a fine-mesh strainer. You should have about 2 quarts of soup. If you have more, or if you think the soup is too thin -- it should have the consistency of a veloute or light cream soup --  simmer it over medium heat until slightly thickened. Taste and, if necessary, adjust the seasoning. The soup can be cooled completely and stored in a covered container in the refrigerator three to four days or frozen up to a month. Bring the soup to a boil before serving.